On Blogging and Personal Transformation. Last weekend I had the opportunity to speak at the Nuffnang Useful + Beautiful workshop. It was such a wonderful day spent connecting with other bloggers and sharing our experiences with one another. We ate salted caramel brownies from Julia's Handmade, Fran from Fall for DIY taught us to make our own camera straps, and there were six talks on blogging best practices. I was really honoured to be one of the speakers and to share my experiences on blogging, personal development, and freelance writing. Putting together my talk made me realize how much I've transformed my life over the past few years and served as an important reminder that when we set out to change our lives, it can be frustrating that we can't just snap our fingers and make it all happen. But when we dedicate ourselves to living the lives we want, it's almost unfathomable how much the world opens up to meet us half way. If you've been reading this blog for a little while you'll know that I believe that life is the product of the choices you make and the actions you take, so I’ve dedicated myself to making big, bold, sparkly choices – which has resulted in some pretty magical things happening to me. However, I wasn't always like this. I struggled with depression for many years and I tended towards being a bit of a naysayer. I loved the idea of traveling, writing for a living and living a stylish life full of exciting people. I was always drawn to books about these kinds of characters and I admired friends who lived their lives like this. But these seemed like things that were possible for other people. Not for me. Instead I spent a lot of time focusing on what I should be doing. Getting good grades. A good job. Being financially prudent. And I worried a lot. I was convinced that everything would fall apart at any moment. I've always had an inexplicable need to express myself and document my life. When I was little I'd make little magazines and write stories that I'd distribute to my friends and family. The Internet opened up the possibility to do this on a much larger scale. I’ve been blogging in one form or another since I was a pre-teen - otherwise known as the Geocities and Angelfire days. And I’ve been on almost every platform since then, but always 'in the closet.' I never shared what I was creating with my friends or family. I struggled with a real fear of being vulnerable. I preferred to let everyone think I was okay all of the time, instead of showing them what was really going on with me like I did online. My views about live, the universe, and everything began to change around the time that I took a course on existentialism in university. Essentially, existentialism comes down to this: Each of us is radically free. We all face limitations imposed on us by physical realities, our histories, material circumstances, etc. But we’re always free to choose. And that’s who we are: the product of our choices and actions. Around the same, I started dipping my toe into the world of personal development and discovered writers like Gala Darling and Alexandra Jaye Johnson who were talking about self-love and living a fabulous life in a no-nonsense way that really resonated with me. I saw a lot of similarities between the concepts of self-love and existentialism – namely an emphasis on personal responsibility and taking control on your own life. I started a blog called Becoming-Sarah (here's a screenshot - I've come a long way!) to document my budding interest in self-love, personal development, and healthy eating. I wrote on this site for about a year without telling my friends or family. I got more interested in blogging and wanted to take it further but I had been in such a vulnerable place when I’d started and I didn't feel comfortable throwing back the curtain and exposing the journey I'd gone through with everyone I knew. I wanted to start fresh. So I shut the site down and stepped back from blogging for a while. Looking at life through the lens of existentialism and self-love shifted something inside of me. Not all at once, but slowly I started to take risks because I knew I had to take complete responsibility for my life. The things I want were possible and it would be my choice if I denied myself them. Looking back, one of those first steps that proved to be truly pivotal for me was taking my first trip to Europe after graduating university. This set in motion a string of events that would change my life in so many ways and really shaped who I am today. But getting back to blogging, The Laughing Medusa was born out of a sense of desperation. After graduating university I was hired for a job that I was in no way qualified for – I became the editor-in-chief of an independent women’s magazine in Toronto. It was a really small operation and I had my fingers in everything - copyediting, setting the editorial direction, liaising with writers, hiring staff, assigning stories, laying out the print magazine, updating the website, working with advertisers, and organizing distribution. On paper, it sounded amazing and it afforded me some really wonderful opportunities. I'm grateful for everything I learned and the possibilities it opened up for me. But it was also a nightmare. My boss was really horrible to work for, there wasn’t a lot of integrity to what we were creating, and I started to have anxiety about my job almost all of the time. Even though I had come to understand that I was in complete control of my life, I felt trapped and didn't know how to leave. Looking back, I learned a valuable lesson. Even the most glamourous dream jobs will have nitty gritty aspects that you hate. It's important to learn to know when to push through because those are just the downsides of doing the work you love versus when things don't feel right and you should cut your losses. For me, it was the latter but it took me a while to work up the courage. I needed an outlet to get back in touch with my creativity and to recommit to my own personal growth. The Laughing Medusa was born as a hodgepodge of whatever was going on in my life at the time and over the past three years, as I’ve grown my audience and learned more about blogging, I’ve gotten clear on what I want my blog to be and what my goals for it are. So my branding and mission have been a slow evolution. You just have to look back through my archives to see how much blogging has helped me grow as a writer and as a person. A year after starting my blog I quit my job to start an independent magazine with a friend and travel across Europe doing research. We were writing about how creative communities were resurrecting post-industrial cities like Detroit and we felt so passionate about what we were doing. To pay my expenses I started freelance writing. The magazine endeavour ultimately wasn’t very successful – we only ever published one issue. But I'm so proud of what we did accomplish and the experience taught me so much about business, self-publishing, and going after your dreams. My biggest lessons were to grow your audience before moving into print - it's very expensive and can be difficult to navigate. Be careful about who you go into business with and get everything in writer. And work from a plan, not from the seat of your pants. This might sound obvious, but it's easy to get caught up in the momentum and excitement you're creating. The plan will change, but it's important to have something to refer to. Ultimately, our travels for the magazine inspired me to move to London. After visiting on our trip I fell head over heels in love with the city and one year after my first visit, I moved here for good. Moving here has been one of the scariest and most wonderful things I’ve ever done. Life as an expat is something I’ve written about a lot. It’s been here that my blog has really begun to flourish and I’ve been afforded so many opportunities because of it – like winning a scholarship to go to The Blogcademy in Berlin and meeting some of my closest friends. It's hard to believe how much my life has changed and it just keeps getting better and better. I still struggle with fear, self-doubt, and resistance - I think those feelings are part and parcel of putting yourself out there and living a creative life. But I'm a happier person these days. I prioritise my own joy. I focus on incorporating into my life anything that will make my reality better align with the visions I have for myself. When I have a big dream, I look for ways to make it happen rather than getting bogged down in the impossibility of it all. It all started with the decision to love myself and blogging has played a huge role in sticking with that commitment. Self-love can seem like a tricky, amorphous concept and even if we want to love ourselves, it's difficult to know where to begin. Try reading Adventures in Self-Love: Where do I begin? and 50 Simple Steps for Cultivating Self-Love if you need somewhere to start. And if there's anything you're struggling with, don't be afraid to reach out; I'd love to help. It's easy to get frustrated because we aren't where we want to be. But it's important to look back and take stock of how far you've come before you decide on what step you'll take next. So let us know, what big changes have you made over the last few years? How are you different now? What have you added to your life? What have you let go of? Take a moment to be proud and grateful for all of it. P.S. Nuffnang was kind enough to feature me as their Blogger of the Month, so hop over if you'd like to read my interview! 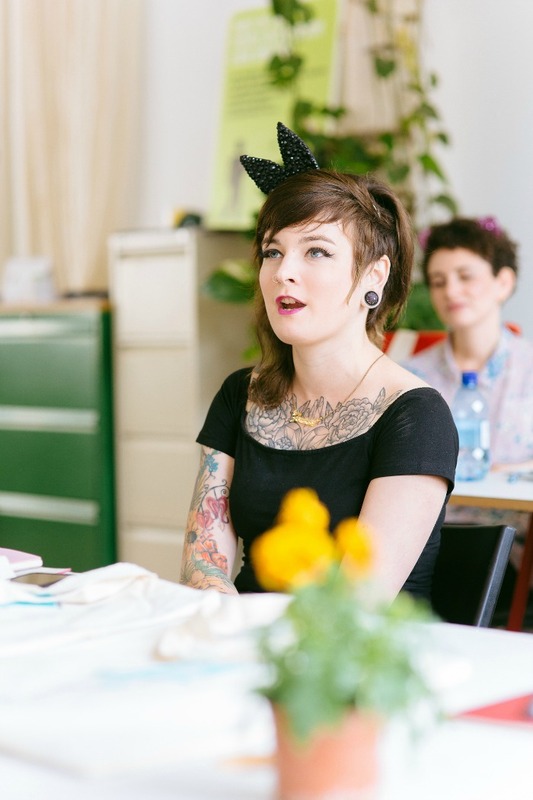 Photographs by the lovely Shel de Mar at The Blogcademy in Berlin. Older PostThe Art of Investing in Yourself.